Five cars were involved in an accident on US 30 this afternoon. 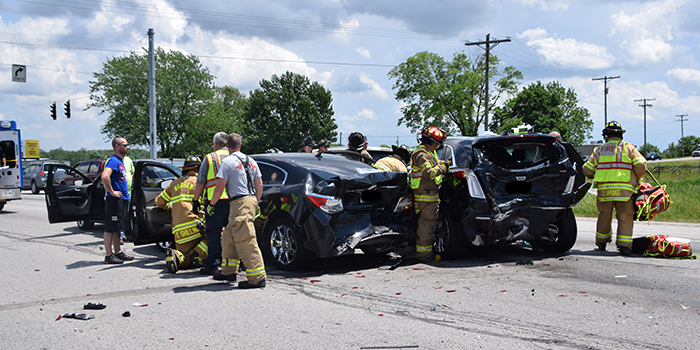 WARSAW — Yesterday, May 31, a five vehicle crash stopped eastbound traffic at the intersection of US 30 and CR 150W. Preliminary investigation by Senior Trooper Timothy Carpenter shows that yesterday around 2:04 p.m., eastbound traffic was stopped for a red light at the intersection of US 30 and CR 150W, when a 1997 Tahoe driven by Timothy Fournier, 19 , Akron, failed to stop causing a chain reaction crash. The Tahoe collided with the rear of a 2017 Cadillac that was stopped in the passing lane. The Cadillac was driven by David Penn, 70, Naperville, Ill. Penn was transported to Kosciusko Community Hospital with non-life threatening injuries. Two female passengers in the Cadillac suffered serious injuries. One passenger was flown by helicopter to Memorial Hospital in South Bend and the other passenger was taken by ambulance to Parkview Hospital in Ft. Wayne. The collision caused the Cadillac to collide with the back of a 2012 Buick driven by Willie T. Peacock, 80, Chicago, Ill. Peacock was transported to Kosciusko Community Hospital with minor injuries. The chain-reaction collision continued by pushing the Buick into the back of a 2015 Dodge driven by Brandon Shumaker, 28, Warsaw. Shumaker was not injured in the crash. After the Tahoe collided with the Cadillac it swerved to the left and collided with the rear of a 2010 Ford that was in the left turn lane of eastbound US 30. The Ford was driven by Bradley Bibler, 58, Warsaw. Bibler was uninjured in the crash. Alcohol and drugs are not suspected as a factor in this crash. This crash remains under investigation. Eastbound lanes of US30 were shut down for approximately an hour and a half for clean-up and reconstruction of this crash. The Indiana State Police were assisted by Warsaw Police Department, Warsaw Wayne Township Fire, Lutheran EMS and Indiana DNR.